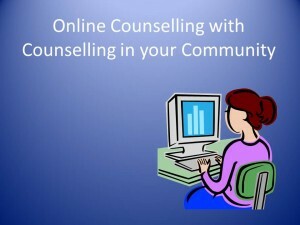 Online counselling, e-therapy or writing therapy allows you to meet and chat with your counsellor using a computer or mobile device. The main advantages of online therapy is that you can do it from anywhere (ideal if you work away or unable to travel) and at a time that suits you . Video Calling – We use Skype video or ichat as our counselling sessions allowing us to talk face to face and in real time. Email Counselling is when we use secure email to send messages to each other, usually once a week. The advantage of email is that you can write spontaneously and it gives you time to read and reflect on what I have written, as well as giving you a record of our sessions. Instant messaging – We can use Skype chat our counselling room and communicate with each other by typing text messages. This means we are both online at the same time, usually for an hour, and it’s more like a normal conversation. Skype Counselling – You need to register with skype (I can provide information on this if you are unsure on how to do this) and you send me your skype address. We then arrange a convenient day and time to have our session. I will call you on at the arranged time and then our session can begin. The session will last 50 minutes. The number of sessions will be agreed during our first session if you choose to continue with the skype counselling. Email Counselling – After an initial contact email (which is free) I will send the counselling agreement. You will sign it with you deciding how many sessions you wish to have. You will write an email outlining your problem including all your thoughts and feelings. I encourage you to write as you talk and randomly as you choose. I will then spend 50 minutes reflecting and responding to your email. You may wish to carry on with 3 or 4 further email communications. In accordance with BACP online counselling guidelines I use safe-mail which is a free email provider. This ensures our conversation is confidential. I can provide details of how you can register with this too. Instant Messaging Counselling (IM)- IM is carried out through skype. Just like skype video, we arrange a mutual time and date. I will call you at the arranged time and we start to chat via messaging. It is best for both IM and video chat that you are in a quiet room where you cannot be disturbed. Skype allows you to save the conversation which allows you to reflect over our session. You may wish to use ichat instead of skype so please contact me if you wish to use this as an alternative. How much does online counselling cost? 1. Video call – each session costs £50 per 50 minute session. 3. Instant messaging– £50 per 50 minute session. Payment must be made in advance of the appointment. Payment is either via paypal using the link to the right of this page. Or if you prefer to pay via bank transfer, I can send you the relevant details.